Mechanical wristwatches exert their beauty by running without batteries, have an audible heartbeat, and the moving hands depict the earth’s movement through space around the sun. The (relative) mechanical simplicity of a wristwatch regulated by a thin hair spring, hands moved by small gears sitting on finely machined pinions spinning pressed synthetic jewels, all powered by a wound-up steel spring. Just like with other mechanical marvels like an automobile or clothes dryers, machines require service including wrist watches. Within the watch world there is plenty of debate regarding whether and/or when to service a mechanical wristwatch. “If it ain’t broke, don’t fix it,” is one prevailing school of thought because the wearer is accustomed to the watch’s quirks and the fear that addressing the quirks creates other unknown quirks. The other school of thought is servicing according to the manufacturers recommendations taking into account that oils, gears, and gaskets wear with time and use and the manufacturer knows best. Some manufacturers such as IWC recommend a service every two years. Rolex on the other hand recommends every five to seven years. The range of recommended service intervals brings into question whether the watch truly requires service for mechanical reasons, or because the manufacturer wants to capture extra service dollars from the watch wearer. The school of thought that a fellow watch enthusiast and watchmaker uses to determine service is to monitor how well the watch keeps time over the years. Once there is a drastic change in the watch’s accuracy, then it is time for service. For example, if the watch consistently loses 2 seconds/day over that last few years, then starts to lose 4 seconds/day, then it is time for service. Disassembly and inspection (check for internal and external signs of excessive wear, case is checked for water tightness, movement is removed and disassembled. A truing caliper is used to check that each wheel is true. All jewels are inspected for cracks. 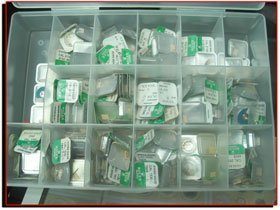 All watch components are put through a multi step cleaning process to remove all oils, corrosion, metal, dust and other contaminants. All watches receive a new mainspring to insure proper operation of the watch. The movement is now assembled. Seven synthetic Moebius oils are used during this process. Beckertime follows the oiling recommendations provided by Rolex. The movement is then regulated to factory specifications of -4/+6 seconds/day. We use Swiss made watch timing machines. The case and band are now restored to “like new” original condition. Of course bands with excessive “stretch” and wear will be refinished to their best possible condition. A new case tube is installed. Watches with acrylic crystals will be fitted with new crystals, models with sapphire will be replaced, if needed, at an additional charge. A complete set of gaskets (crown, caseback, among others) are installed and assembly is completed. The assembled watch is subjected to final timing and a second pressure test is administered to insure that the accuracy and waterproofing of the watch is as good as when the watch was new.